celebrated the 10th anniversary of „Ballroom Stories“ (2007), Waldeck ́s most successful album to date: The perfect moment for his label Dope Noir Records to celebrate with the release of a worthy successor under the promising name “Atlantic Ballroom”. So far so good. It is indeed a pleasant experience for both label and artist when the commercial success of an album exceeds expectations, as was the case with “Ballroom Stories”, which slowly grew from a connoisseur’s pick to a long term bestseller. While providing a comfortable reference for Waldeck and others, it also became an artistic and commercial benchmark for any subsequent work to be released by the artist. Fans were naturally hoping for a follow-up “in the style of”. Meanwhile, new presentation formats have fundamentally changed the musical landscape. Algorithms have attached themselves to the artist’s foot for some time now, and it is difficult to get rid of them. The “algo anklet’s” grip is adamantine: If your song intro is longer than thirty seconds, chances are that people’s attention will have wandered off to somewhere else; that traditional album format for musical releases: No longer valid. So why bother at all? Rather than trying to meet his brand expectations, Waldeck decided to side-track the public with something light and easy. In 2016, Dope Noir released his Spaghetti & Western album “Gran Paradiso“, reveling in Italian song traditions and genre antics. So what to do? Warm up old recipes? Italian…? Not so much. A new ballroom without Electro and Swing? A pinch of James Bond…? Or even high-speed bossa nova, electro rumba? Sounds promising, but at least a bit of swing? The birth of “Atlantic Ballroom” or: remembrance of things past. 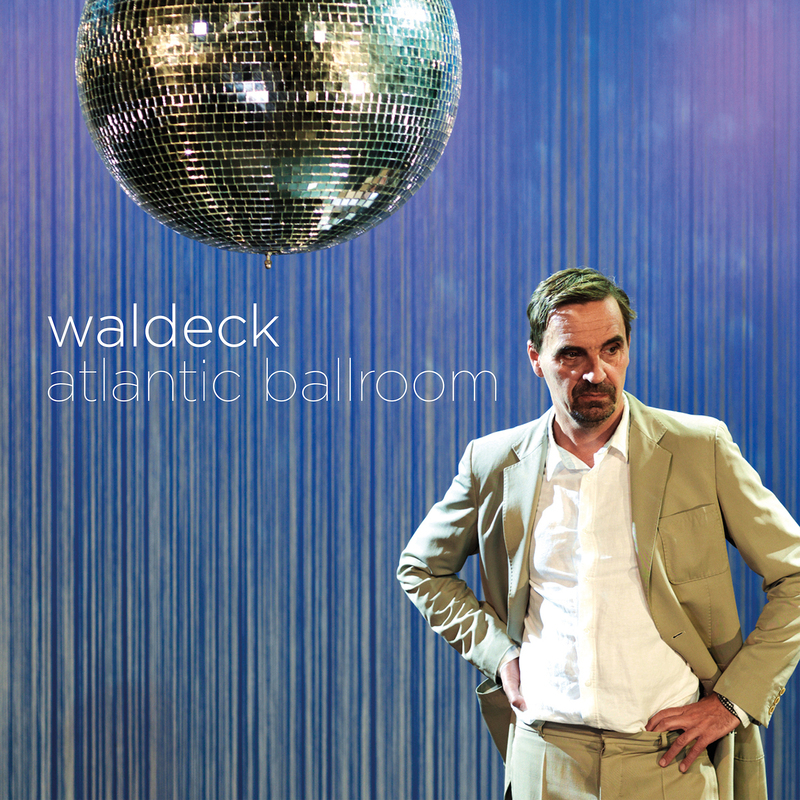 Waldeck refuses to warm up old recipes and creates a new – amazingly refreshing ballroom. As a listener, you feel nothing of the laborious creation and are immediately drawn under the spell of the “Atlantic Ballroom”. There is a sense of optimism. As with previous releases, Waldeck underlines his ability to create a new sound universe. The music makes you feel like you remember something you haven’t actually experienced. Waldeck plays with smoky jazz riffs & bluesy piano phrases. You can feel a pinch of Viennese electronics, but the reference is discreet. As a listener you rightly ask yourself how it is possible to deliver such a dignified and relaxed album, when the circumstances seem anything but easy. Waldeck puts it succinctly: “It is usually not easy to create lightness among the listener”. Waldeck points the way with the opening track “Rough Landing”. The song would be perfect as a title song for a Bond movie still to be shot – maybe “James Bond in Paris” (2024)? This fits the album title, because somehow the 12 tracks seem very “transatlantic” and refer to an era when many American jazz musicians cavorted in Paris in the early 1960s. The catchy tune “Never Let You Go” – a lightly presented concession to the friends of swing – also seems francophile and pensive. Featured singers are led by Ferrara, but also include longtime soul mate and legend Joy Malcolm with the Northern Soul Smash hit “Keep My Fire Burning” and Vienna-based Big John Whitfield on “Bring My Baby Back Home”. Waldeck’s musical influences for this album range from Henry Mancini, John Barry, Wes Montgomery, Fats Waller, Lalo Schiffrin to Dave Brubeck. While the clarinet still played the leading role in “Ballroom Stories”, the brass, especially the trumpet, now dominates in “Atlantic Ballroom”. Irony of fate or simply intuition: Just as “Ballroom Stories” was referring to an influential era for the time of its release, namely the 1920s and 1930s, “Atlantic Ballroom” musically captures – this time almost in real time – the end of an era: the post-war order of the transatlantic alliance, which many of us consider irrefutable, seems to have irretrievably been shaken.